Your wet and wild adventure begins at Sea Isle Marina. This jet boat ride is not for the faint of heart — get ready for 30 minutes of pure adrenaline! Your speed demon captain will whisk you out on an unforgettable ride. 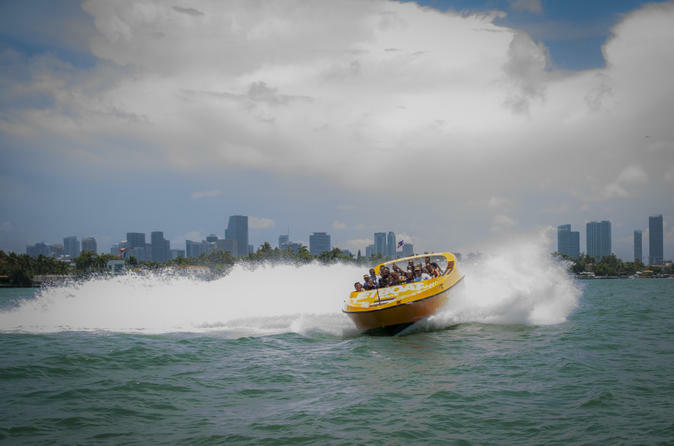 Board the bright orange vessel and hang on tight as you hit full-throttle, cutting through placid waters and taking in the sights of Miami from a new perspective. Watch the skyline fade from view as you zip to the San Marco Islands and see the water sparkle beneath you. Your vessel speeds at a pace that would make the dolphins jealous. Next up is Memorial Island, where you’ll see the fabulous houses of the rich and famous. Bust out your cameras for some first-rate photos and then speed back to Sea Isle Marina. Once you’re back on land, consider picking up a survivor T-shirt (own expense) to commemorate your adventure. Please note: Be prepared to get wet! Ziploc bags for your personal items will be provided and ponchos are available for purchase. During the winter months, layers are strongly advised.